After that, the Aztecs believed that each warrior slain in battle, rose up to the sky before being reincarnated as a hummingbird and fed off the flowers in paradise. At night they became soldiers again, defending daylight from the powers of darkness. It is a beautiful myth and hardly surprising that Americans love to entice them into their gardens. The Native American Ohlone people told a charming story of how the hummingbird acquired its red throat and saved the world by bringing fire to it. 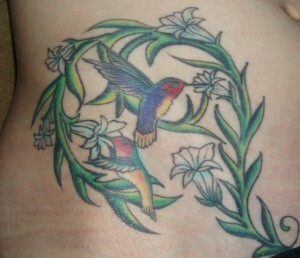 The hummingbird is the national symbol of the Caribbean island of Jamaica and is considered sacred. With such lovely myths surrounding the hummingbird, it is not surprising that it has become one of the most popular birds in the world and that hummingbird tattoo designs are so sought-after by tattoo-lovers. The designs available are numerous – over three hundred different hummingbird types and styles. One of the most popular is the black-chinned hummingbird which is a pretty stand-alone design, but if you fancy a touch of the exotic then you could consider the sapphire-chinned hummingbird with its beak buried deep into a scarlet tulip. Another delightful image is a colourful hummingbird in flight and contemplating landing on some imaginary nearby flower. Hummingbirds are quite territorial creates and a bird with its busy little wings spread wide is generally thought to be a symbol of aggression. 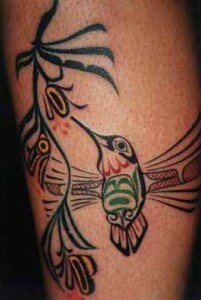 Tribal hummingbird designs which use thick black ink are also quite popular as is the rather romantic idea, for couples, of having hummingbirds facing each other, like mirror-images. For that added touch of romantic commitment, surrounding the bird with the name of the loved one sends a very clear message of love. 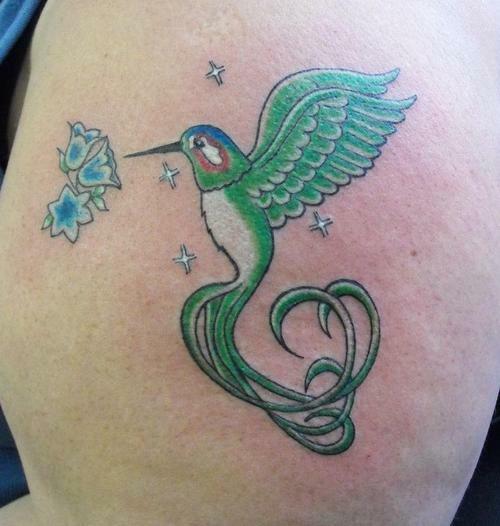 Because hummingbirds are small in nature, it is better to keep the tattoo small as well. The areas of the body that lend themselves best to small tattoos are the ankles, wrists and upper arms. But why leave your tiny bird all alone? Be creative with your design by adding flowers, leaves or vines or using your own artistic skills to create your own truly unique hummingbird tattoo designs.